Pearl Pirie. The Pet Radish, Shrunken. (BookThug 2015). She’s insistent: ’sense is as sense does. Sense is as sense is made.’ And her poetic makes a lot – of different things here. Pirie plays with various forms, a kind of wild ghazal, prose poems, little playlets, sheer joyful & willful language games. The Pet Radish, Shrunken is a bit of a literary roller-coaster. Not everything works (for me), but there’s more than enough I can praise here. I like the way in which Pirie can shift, within a line, from the personal or local out, to the planetary or cosmic: ‘lose an evening chez chefs / their red snappers, ocean wars’ or, all too much to the point at this political moment, ‘when it wasn’t up to multinationals like ikea to support refugee camps. / when we compare ourselves with gods our losses are less small.’ Point of view, as many of these poems suggest, is variable, even within the singular poet. Pirie is a master of the sharp one liner, as in this bp-ish little take: ‘pr is the inevitable start of any time / of prayer.’ Elsewhere she is heavily into portmanteau hyphenated constructions which she then wrestles into different syntactical usages: ‘re-lifestyle the monkeymind’ for example. Or she takes words apart, for similar purposes. Yet for all this play, she can also turn to a metaphysical poetics of existential awareness, as in ‘scratch the surface.’ One of my favorite poems in the book, it’s beautifully modulated in its almost cosmic understatement, as it moves from ‘a white line along the forearm’ to ‘we, that storm of particles refilling earth. // we, hills, moving, with spines running thru / don’t return to dust. 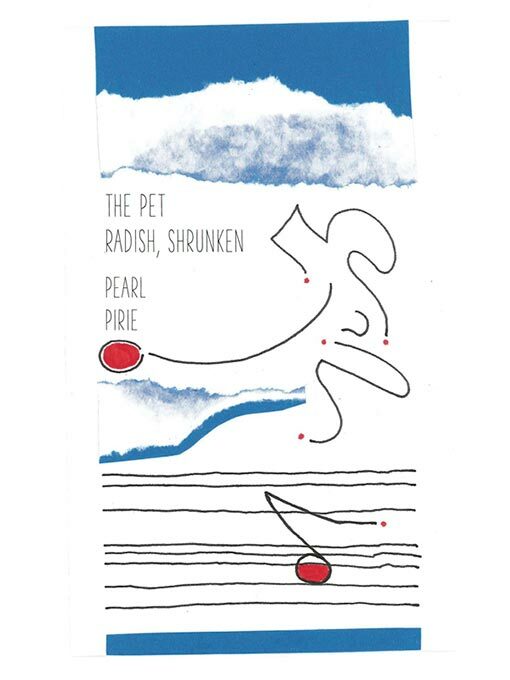 have never left.’ The Pet Radish, Shrunken offers many moments that hold a reader tight, slightly off balance, & glad to be so.